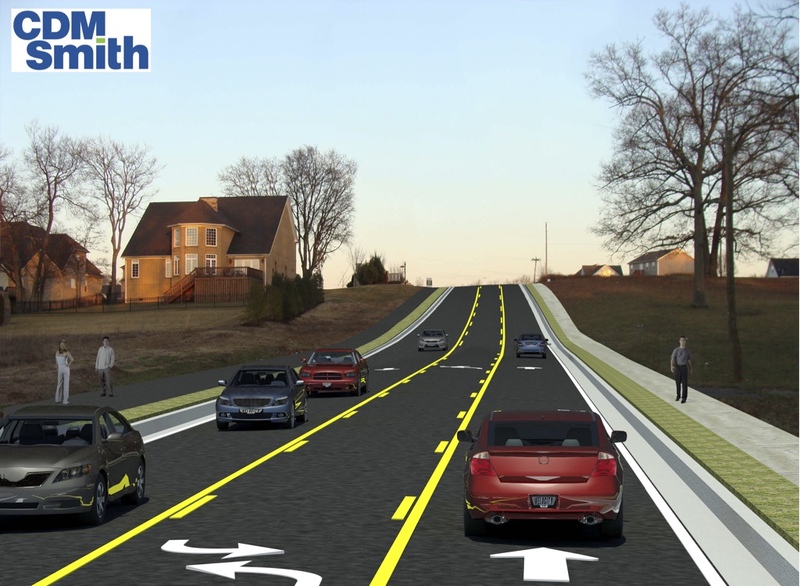 Through the City of Spring Hill's cost sharing with TDOT, Duplex Road (State Route 247), a state roadway, is being widened to three lanes (two travel lanes and a center turn lane) with a 5-foot-wide sidewalk on the south side and a 9-foot-wide multi-use path on the north side. The City spent nearly $10 million on the design, engineering, the acquisition of 210 pieces of property for the road right-of-way, and for the relocation of some of the utilities. TDOT started the construction project in Fall 2017. The project is estimated to take about 2 1/2 years. On Sept. 15, 2016, when TDOT Commissioner John Schroer spoke at the Transportation Summit in Franklin, he noted the timeline for new state road construction generally takes about 10 years. The year 2016 made 10 years that the City of Spring Hill has been working toward this project with TDOT. In early 2017, the Duplex widening construction officially went into TDOT’s three-year work plan. The City’s top priority in pursuing right-of-way was to first secure the property right-of-way (ROW) easements needed to install temporary traffic signals at the four key intersections along Duplex Road, including Port Royal Road, Miles Johnson Parkway, Commonwealth Drive and Buckner Lane. Duplex Road (State Route 247) is a state roadway that runs along much of the southern dividing line between the Maury and Williamson County line dividing Spring Hill. Duplex is a narrow, two-lane road with no shoulders, dropping off at its edges to sharp ditches, creating a dangerous traffic situation for the many residential neighborhoods it serves. In Fall 2017, the Tennessee Department of Transportation (TDOT) began construction to widen the full 3.2 miles of Duplex Road to three lanes (two travel lanes and a center turnlane - each 12 feet wide) from Main Street (U.S. 31) to just before Interstate 65, with a sidewalk on one side and a bike/multi-use path on the other. It will include curb and gutter stormwater drainage, expansion of turning radiuses at key intersections, the construction of two new bridges, and large hills will be cut down to create better driver visibility. In November 2012, TDOT stated in a letter to the City of Spring Hill that the installation of traffic signals were warranted at the four aforementioned intersections. The Nashville Metropolitan PlanningOrganization (MPO) did not have Duplex widening on its three-year plan at that time. While continuing to work with the MPO to list the project in its three-year plan, Spring Hill officials began inquiring whether there was a way to quickly secure the property right-of-way needed to install the four badly needed traffic signals in advance of the Duplex widening construction. The City inquired whether it could gain property right of entry, or propose a property rental agreement with landowners. City officials were informed by TDOT that, regardless of the intersections meeting signal warrants, there was no other avenue that could be taken outside of purchasing all of the needed right-of-way to install the poles for the signals, according to the requirements of the federal Uniform Right-of-Way Act. Whenever federal highway funds are spent on any transportation construction project – which is the case with the state’s construction of the Duplex widening – it requires following the detailed Uniform Right-of-Way Act, required by the U.S. DOT’s Federal Highway Administration. To demonstrate the City’s shared commitment to the project, the Spring Hill BOMA agreed to put aside $4 million in city taxpayer funds to pursue the acquisition of the state’s right-of-way that would be needed to install the signals and widen the road. As an example, a long-awaited temporary traffic signal was installed in December 2016 at the intersection of Duplex Road and Port Royal Road, the first of the four signals. After a 21-month process of appraisals and negotiations with multiple property owners, the City acquired property access, with TDOT approval, needed to construct the signal, which was critical to public safety along Duplex Road. The lengthy property right-of-way acquisition process started in late 2014. It required hiring a team of consultants to handle the property acquisitions who were required to follow a very time-consuming and tedious legal process to acquire each property. This involves having the properties appraised, locating property owners, tracking down lien holders, negotiating a fair market price, taking proposed sale prices to the BOMA for consideration, making an offer to the property owner, following legal steps to purchase and acquire the property, and legally closing on each property sale. Many times there were a range of complications that arose with the property acquisition, such as not being able to locate an out-of-state owner; not being able to locate the lienholder; the City having to pay to have bank liens released; not being able to come to an agreed upon negotiated sale price; among other complex real estate and legal issues. With 210 individual properties to acquire, involving over 200 individual property owners, Duplex Road was the state’s largest undertaking of ROW acquisition by a single municipality for a road widening project.